The first time I held a piece of cold smooth porcelain clay in my hands I felt an affinity with this wonderful translucent material that I couldn't explain, and I still feel the same today. I love working with porcelain and because I hand-build and my pieces are free-form, I never quite know what will appear which is incredibly exciting. The making process is long and fairly drawn out and at any time things can change - sometimes at the dry stage when I am finishing a piece prior to its first firing, part of it may give way and a new shape will emerge and I will think, 'Ah, there you are, that's who you are meant to be'. Each piece is unique and I have watched people nestle a piece into their palm and instantly know it's the one for them. The contrast of the smooth luxurious lustre interior and the organic non-glazed exterior, leaving the porcelain to speak for itself, gives it a very tactile quality. Creativity has always been a strong theme in my life, I have always been interested in the world of design, retail and anything individual and hand-made. Creativity and inspiration are very important to me and I love being a potter. I use gold and platinum lustre, filling my work with light at the final stage. 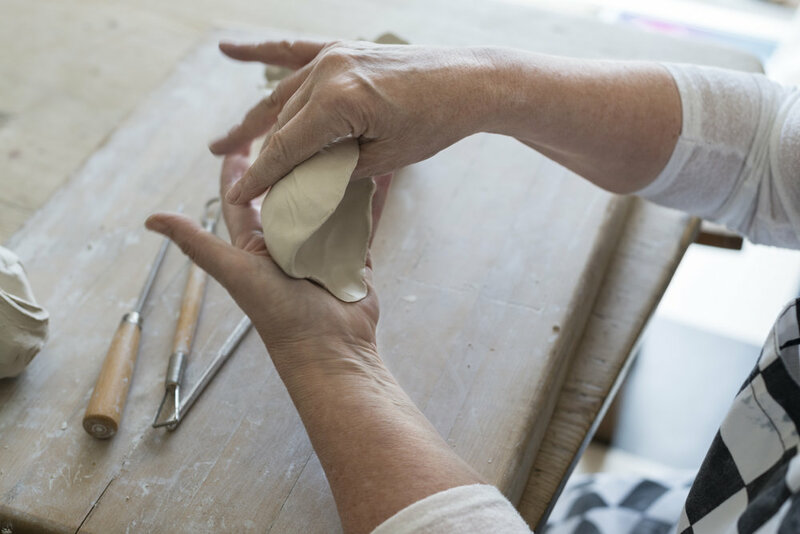 This comes after a long process of hand=forming, carving, finishing, firing, glazing, firing again and then adding the lustre in the third and final firing. Working with lustre is challenging; I never quite know, until I open the kiln, whether the lustre will have worked properly but this is part of the magic and alchemy. I am very lucky to live between the moors and the sea in Devon which is such a beautiful part of the world, and on a clear day I can just see the River Dart from my studio window. Some of my pieces are tiny, like jewels, other are larger and more sculptural, reminiscent of waves and pebbles, fire and water, but all made of the earth, of course.